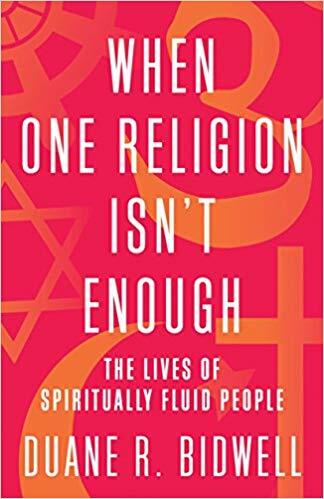 Duane R. Bidwell’s book “When one religion isn’t enough: The lives of spiritually fluid people” (Beacon Press, Boston, US, 2018) is about persons who feel an affinity with more than one religious tradition. In this post I look at some of the ideas of this book. Growing up in India means growing up together with persons of different religions – India is the original multi-religious country. Often persons growing up in India can have different religions in their family histories and thus accepting different religious traditions is quite common. Duane is from a Protestant Christian background and his approach to looking at multi-religious identities seems more analytical, compared to the emotional approach I had while growing up in India. Persons like Duane, come from traditions that believe in one prophet or a “true God”, and when they find themselves attracted to different religious ideas, they need to find a logical explanation for their ideas. How and why does someone become spiritually fluid? Are spiritually fluid people simply confused, syncretistic, unable to commit? Are they idolaters? How should we make sense of spiritually fluid people? Do they belong in our religious and spiritual communities? What might they teach us? And what do complex religious bonds imply about our own religious and spiritual identities, practices, and commitments? … I do not believe that God is one or that all paths reach the same mountain. Religions are not different descriptions of a single reality; they describe different (and sometimes related) realities. I was a little shocked when I read what Duane says here - "I do not believe that God is one or that all paths reach the same mountain." Different religions originated in India including Hinduism, Buddhism, Jainism and Sikhism – together these religions are called the Indic religions. In the Indic religions, we often say that God is one and all the different paths (religions) lead to that same ultimate truth. Normal spirituality believes in religious monogamy; people must leave one religion to cleave to another, taking on a new name, a new identity, a new set of beliefs and social mores. The old life is gone; a new one begins. But some people claim two (or more) religions at the same time. Maybe they belong to a Christian church and practice Buddhist meditation, or they grow up with a Jewish mother, a Hindu father, and an extended family that doesn’t expect them to choose one tradition or the other. Or they might publicly identify as Muslim while secretly praying to Hindu gods … it can confuse and perhaps threaten people who have only encountered singular religious and spiritual identities … More often it leads to conflict in families, communities, institutions, and individuals. Spiritually fluid people seem exceptional because cultural conversations in North America, Europe, and parts of the Asia-Pacific region position them that way. Public conversations tend to frame spiritually fluid people as privileged, subversive, or both—an attitude that keeps religious multiplicity out of the public eye … First, academic discourse tends to frame religious multiplicity as exotic, elite, and rare and therefore distant from what most think of as ordinary. Second, because it can be dangerous to violate family, community, and institutional expectations of normal spirituality, some spiritually fluid people—especially those bonded voluntarily to two or more traditions—fail to identify publicly as religiously multiple. Much of this (academic) writing assumes a normal spirituality, especially the ideas that (a) religious traditions have clear boundaries, (b) religions are primarily focused on doctrine, and (c) conflicting spiritual or theological perspectives must be reconciled. … Ordinary people who live religiously multiple lives are seldom celebrated and often unseen. They hide their multiple allegiances from family members who will not tolerate someone practicing a different faith; they mask themselves in one or more of their religious communities to avoid shame, judgment, punishment, or other negative consequences; and they switch from one type of religious language to another, depending on context. Duane acknowledges the different approaches to "spiritual fluidity" among different cultures. Thus, while persons raised up in monotheistic religions feel the contradiction between the doctrines they have learned from childhood and their attraction to other spiritual ideas, indigenous persons growing up with more open traditions in Asia, Africa and South America do not always see any contradiction. Thus, in countries where monotheistic religions dominated, in the past, spiritual fluidity often had to be hidden. This may still happen to some degree. Jewish families in Spain and Portugal converted to Catholicism to save themselves from the Inquisition but continued Shabbat rituals in secret, and Buddhists in Sri Lanka (then known as Ceylon) converted to Christianity to qualify for stable, higher-paying jobs but still participated in ceremonies at Buddhist and Hindu temples. In North and South America, governments insisted that indigenous nations “civilize” themselves by becoming Christian, a policy that made indigenous people hide their spirituality beneath a veneer of church language and practice … “The problem with Indian Presbyterians,” one denominational executive said to me more than a decade ago, “is that they want to be Indian and Presbyterian at the same time.” Outside the North Atlantic region, religious lines aren’t always so sharp. European missionaries encountered this porosity as they began to evangelize people in various regions of Asia. When Catholic priests arrived in India, for example, the emperor Akbar delighted the Jesuits who came to convert him. He assured them that he had indeed become a Christian—and then infuriated them by continuing to worship as a Muslim and, in many ways, a Hindu. This multiplicity was not what the Jesuits had in mind at all and is yet another incident that reveals how Europeans regarded the boundaries between religions as impregnable, whereas Indians saw the lines as rather porous. Sometimes people adopt dominating religions because these allow them freedom from religious persecution or access to education, mobility and resources. Yet, at the same time, they may continue to believe in their ancestral beliefs, though they may hide these beliefs from their new religious companions. Today’s complex religious belonging also reflects centuries of Christian expansion beyond Europe. Through encounters with local spiritualities and other religious traditions, Christian missionaries have seen spiritual fluidity as an option for centuries. Those sympathetic to local religions, like Ruben, sometimes developed spiritually fluid ideas, practices, and identities. At the same time, local residents forced or persuaded to convert to Christianity might continue to practice their original religions in secret. Other local people converted (or added Christianity to their mix of spiritualities) because of the link between Christianity, social mobility, and economic privilege. By adopting strategic multiplicity—performing Christian norms in public while practicing original traditions at home—local people gained access to otherwise unattainable economic and social goods. Over the recent past, in India, there have been a lot of debates about religious conversions and many persons ask for strict laws to stop induced or forced conversions. However, Duane's point is that conversions can be a way of multiple religious identities and thus act as bridges between religions. Thus to safeguard cultural unity of persons, it may be a better strategy for Indic religions to continue to be welcoming to the converted persons, so that they can acknowledge both their religious identities instead of being forced to give up their original religious identity. Many people who inherit complex religious bonds grow up in an interfaith family. They have a Jewish mother and a Christian father, for example, and grow up attending church and synagogue. Others might have a Christian mother and a Hindu father and refer to their family religion as Chinduism. Still others are raised by parents of two religious traditions, with aunts, uncles, grandparents, and cousins from several other traditions. Duane shares different life-stories of persons to explain the complexities in dealing with spiritual fluidity. One of these stories is of Sita, a Caribbean immigrant to Canada, which raises the issue of fitting different religious identities in public and private. Until Sita started school, she thought every home honored Jesus and Hindu gods at the same time. “As I got older, I became more aware,” she remembers, “kind of realizing: Oh, OK, the Christian part is the part that fits in with society, the part I can mention in school. The Hindu stuff is the stuff I keep to myself ... I remember in school, if people asked, ‘What did you do on the weekend?,’ I felt comfortable saying we went to church. I wouldn’t have felt comfortable saying we went to puja, which is one of the words for prayer gatherings in the Hindu faith. So I just sort of instinctively learned to hide it, because it wasn’t—because if I had said it, they wouldn’t have known what I was talking about. A few years ago, I had thought of conducting a research with interfaith couples to understand how they reconciled their religious differences, especially in terms of religions of their children. However, after some initial work I had given up that idea as I wanted to do other things. However, I think that if I had done that book, I would have approached this subject very differently from how Duane's has done it. Till some years ago, I had a t-shirt that I had bought in India, which showed symbols of different religions and carried the words, "God is too big to fit in one religion" - to me, those words are a better expression of how I look at multiple religious identities. When I started reading this book, initially I was a little frustrated by the gap between my own emotional approach to spiritual fluidity compared to the analytical approach adopted by Duane. Before reading this book, I had looked at spiritual fluidity as exclusively a positive value, while I had ignored that for some persons, it can be a challenging path. I am glad that I persisted with the book and I think that I have gained some new insights from it. I believe that in future with increasing international travels of persons from different countries, the encounters between persons of different religions and interfaith marriages are going to increase exponentially. At the same time, with a decrease in the controlling power of traditional religions, increasing number of persons are going to experiment with and adopt spiritual ideas from different traditions. Such mixed couples and their mixed families can help in building bridges between the people. I think that Governments should document and valorise these multiple identities. For example, in the national censuses, instead of assuming that persons belong only to one religious traditions, countries should provide specific options for persons with multiple religious identities. Learning about different spiritual beliefs, celebrating all the different religious festivals, can be a way to promote peace and brotherhood in the 21st century. Duane's book provides important reflections and insights on this crucial subject.